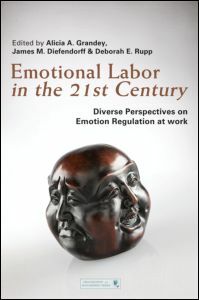 서명/저자 Emotional labor in the 21st century : diverse perspectives on the psychology of emotion regulation at work / ed.by Alicia Grandey ; James Diefendorff ; Deborah E. Rupp. 기타저자 Alicia Grandey James Diefendorff Deborah E. Rupp Diefendorff, James Rupp, Deborah E.
발행사항 New York : Routledge Academic , 2013. 서지주기 Includes bibliographical references and index. This book reviews, integrates, and synthesizes research on emotional labor and emotion regulation conducted over the past 30 years. The concept of emotional labor was first proposed by Dr. Arlie Russell Hochschild (1983), who defined it as "the management of feeling to create a publicly observable facial and bodily display" (p. 7) for a wage. A basic assumption of emotional labor theory is that many jobs (e.g., customer service, healthcare, team-based work, management) have interpersonal, and thus emotional, requirements and that well-being and effectiveness in these jobs is determined, in part, by a person’s ability to meet these requirements. Since Hochschild’s initial work, psychologists, sociologists, and management scholars have developed distinct theoretical approaches aimed at expanding and elaborating upon Hochschild’s core ideas. Broadly speaking, emotional labor is the study of how emotion regulation of oneself and others influences social dynamics at work, which has implications for performance and well being in a wide range of occupations and organizational contexts. This book offers researchers and practitioners a review of emotional labor theory and research that integrates the various perspectives into a coherent framework, and proposes an agenda for future research on this increasingly relevant and important topic. The book is divided into 5 main sections, with the first section introducing and defining emotional labor as well as creating a framework for the rest of the book to follow. The second section consists of chapters describing emotional labor theory at different levels of analysis, including the event, person, dyad, and group. The third section illustrates the diversity of emotional labor in distinct occupational contexts: customer service (e.g. restaurant, retail), call centers, and caring work. The fourth section considers broader contextual influences – organizational-, societal-, and cultural-level factors – that modify how and when emotional labor is done. The final section presents a series of ‘reflective essays’ from eminent scholars in the area of emotion and emotion regulation, where they reflect upon the past, present and future of emotion regulation at work. 3.Motivation, Fit, Confidence, and Skills: How Do Individual Differences Influence Emotional Labor?